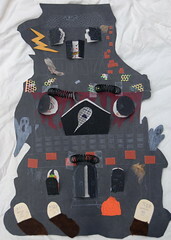 Here’s a haunted house my daughter created for today (windows and doors open up to reveal scary things). A few posts ago I talked about the fall’s “new year” feeling. I mentioned the Jewish New Year being celebrated in the fall, but I forgot about the Celtic New Year, Samhain (pronounced more like s-aun, I think). The Celts of pre-Christian Ireland and Scotland had a circular view of life, and around October 31 they celebrated the end of summer and harvest at the same time as they looked forward to the new life and light that would emerge out of the death and darkness of winter. Samhain was considered a time when the boundary between the living world and the otherworld was thinest, when the dead could return and warm themselves at the hearth fires of the living and some of the living (such as poets) could enter the otherworld at certain special locations. 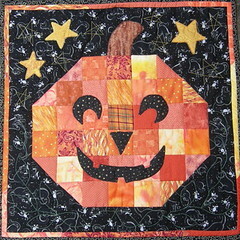 Samhain was Christianized into All Saints’ Day or All Hallows’ Day on November 1, and Oct 31 became All Hallows Even (Halloween). People dressed in costumes to either scare away evil spirits or blend in with the dead who may have returned for a visit. Bonfires (bone-fires, on which bones of cattle slaughtered for the winter were thrown) were lit to fend off evil, unite the community and remind of the light to return in the spring, divination games were played, and turnips (later, pumpkins) were carved with scary faces to scare away evil spirits or possibly to symbolize skulls of the dead. It’s hard to know exactly what the original meanings were behind the different symbols and customs now associated with today’s candy-eating, costume-wearing celebration, but it sounds like it was not only a sacred or more deeply meaningful time for the ancient Celts, but it was also fun even then. Yesterday, after what felt like weeks of rain, it was surprisingly sunny and warm, and I was stuck inside all day (my only outing, to the dentist). 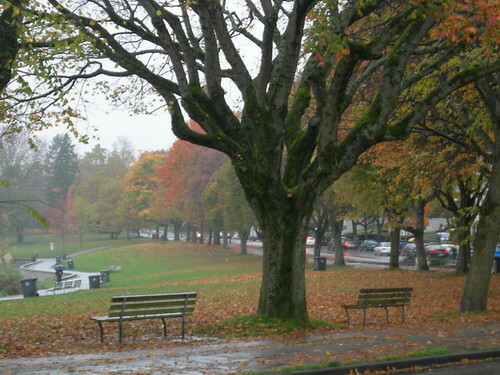 Today, I had a meeting in English Bay, where I was hoping to linger, walk around and enjoy the scenery, and it was raining again. To make things worse, I sat on a wet bus seat on the way there, and had a cold, damp bum the whole time I was out. But I’m not really complaining (at least not too much). 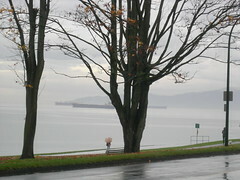 It takes more than rain to ruin an outing to English Bay. A tall soy hot chocolate and an ocean-view chair in Starbucks also goes a long way to assuaging the situation (as well as providing the opportunity to jot down a haiku without getting wet). Manga Touch was successfully “launched” Saturday at Nikkei Heritage Centre in Burnaby. I read from the book and gave a Power Point presentation about how I came to write it: from my first introduction to Japanese manga and anime (the 1970s TV series, Speed Racer, which my brother and I used to run home to watch after school) to some of the things I experienced on my research holiday in Japan (from historic sites and ancient traditions still practiced to modern bullet trains, Tokyo fashion and manga shops). 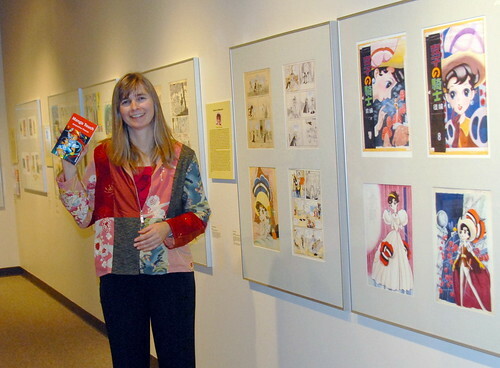 Here I am in the shojo manga exhibit (my launch was planned to coincide with the exhibit at Nikkei Centre’s museum), standing next to artwork by Osamu Tezuka, a great pioneer of Japanese manga and animation. And if you were one of those kids who used to run home after school to watch Speed Racer, here’s some Speed Racer trivia for you: The series, called Mach Go Go Go in Japan (playing on the Japanese word for “five” and the English word for “go” — as in “go Speed, go!”), started as a manga book series in the 1960s. Speed’s look was inspired by Elvis Presley’s race car-driving style in the movie, Viva las Vegas. Speed’s car, the Mach Five, owe’s a debt to James Bond’s gadget filled Austen Martin in the movie, Goldfinger. A live action Speed Racer movie is due out in 2008! 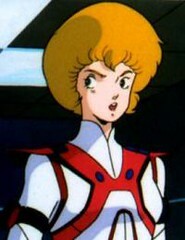 Another bit of trivia: I called the main character in my novel, Dana, after Dana Sterling, the spunky female Veritech Hover Tank pilot in the 1980s anime series, Robotech (Masters saga). I did this as sort of a joke going back to my university days when I was part of a group of students hired to research children’s cartoons, toys and their influence on children’s play. Robotech (which was created out of three Japanese anime series) was our favourite cartoon (we watched more of this one than was necessary for the research), and at least one of the guys in our group had a crush on Dana. 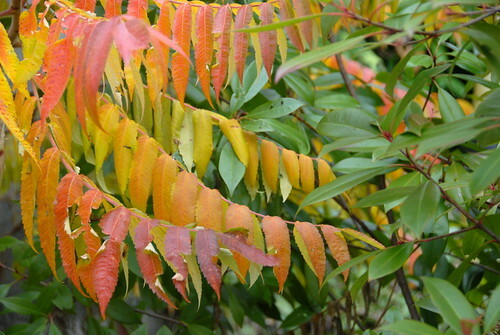 This week I’m guest blogger at my publisher’s site. Check out my first post here. Well, this has been a crazy busy fall. Not only have I been preparing for the launch of my new book, which is a week away, and the unveiling of my new web site (coming soon! 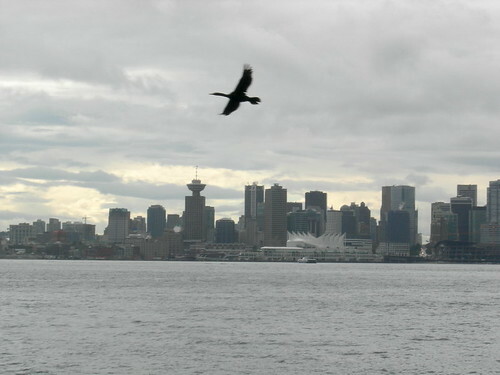 ), I’ve been helping organize the Children’s Writers and Illustrators of BC (CWILL BC) Fall Book Harvest (unfortunately, the event has been cancelled due to the ongoing city workers strike), working on a history project at my daughter’s school, today sent off four poems to an anthology of hockey poetry for kids (cross my fingers that at least one will be accepted), and next week I’ll be guest blogger on Orca Publishers website. To top everything off, yesterday I found out that the house I’m living in has been sold (and I didn’t even know it was for sale!). I received the info, not from my landlord, but from a member of the work crew that showed up in my yard ready to dig up soil samples for the developer who just bought the property and the two adjoining ones. Yes, the house and yard where we have lived for the past ten years is about to be destroyed to make way for a big condo development. I knew this would likely happen eventually, but I guess I’d niavely thought we might have a few years left, so the news was a bit of a shock. Our house is old, in need of repair and wont be a great architectural loss when it is torn down (though it will be hard for us to find another place that is comparable in terms of space, privacy, convenience, the allowance of pets, affordability, etc), but it will be a big loss to see all the trees go. We have a huge yard that is full of mature trees and bushes (including several that we planted ourselves when we moved in). As my daughter says, I don’t care about the house, but I’m going to feel bad about the trees. It’s also disconcerting not knowing exactly when we’ll have to leave or where we’re going to live when we do. It’s here! 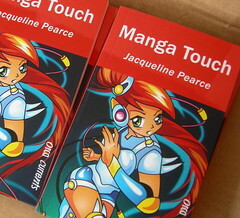 My new novel, Manga Touch, just arrived, fresh off the press. With the big launch only two weeks away, I was beginning to get concerned. Now, I just have to get everything else ready for the event. . .
To answer the question “manga what?”, the story is about a North American teenager who loves Japanese manga (comic books or graphic novels) and is a bit of an outsider. When she goes on an exchange trip to Japan, things do not turn out the way she expected. The launch is being held at Nikkei Place, a Japanese-Canadian cultural centre, at the same time as an exhibit of Shojo (girls’) manga visiting from Japan. Thoughts on time, the cityscape, etc. 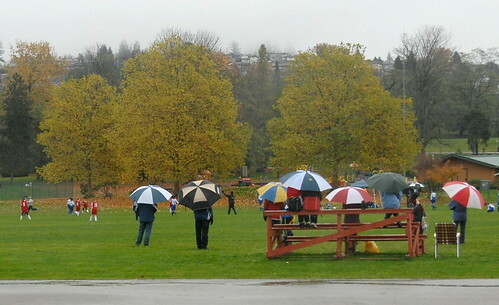 I spent yesterday (Sunday) in the rain at Vancouver’s Word on the Street festival, ducking under tents to hear authors read and to warm up next to those portable out-door heaters. I wasn’t sure if there would be anyone left by 3:30 when I read from The Truth About Rats (and Dogs), but the tent ended up filling up, and it was great to meet some readers who’ve been enjoying my books. I didn’t have any live rats with me this time — just a puppet (much to the relief of the older lady who said she forced herself to come and hear about rats in the hope that it would help her hate them less). One of the highlights of the day for me was hearing former actress Meg Tilly read from her new YA novel, Porcupine, taking on the voice of the main character as she read. It was also enjoyable meeting up with other children’s book authors and friends. 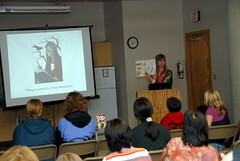 Below are some photos I took at the event and posted on the BC Children’s Writers and Illustrators (BC CWILL) blog. 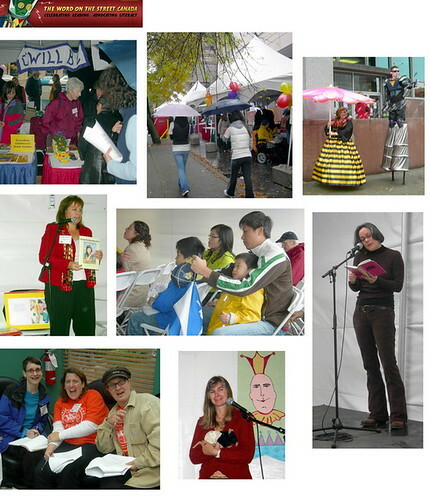 It includes CWILL authors Heather Kellerhals-Stewart and Norma Charles at the CWILL table (top left), Deborah Hodge (reading from her new picture book at middle left), Meg Tilly (lower right), Tiffany Stone, Kari-Lynn Winters and fellow Tickle Trunk Player Lori Sherritt (bottom left) and me (middle bottom).